Take your herbal cooking to new heights using special herbs and ingredients with The Gourmet's Garden. Anne Gardon is the best kind of cookbook author; she grows her own herbs. Included in the 75 delightful recipes are mint spring rolls, lamb chops with bee balm, chicken and lovage pot au feu and quick apple tart with lemon basil. In addition to gardening and cooking, Anne also takes all the photographs found in her book. Each recipe is illustrated with a stunning color photo that inspires just by being there. 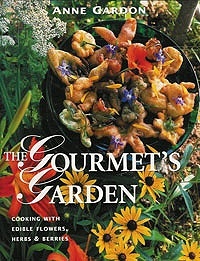 Ms. Gardon was awarded the Silver medal at Cuisine Canada's Culinary Book Awards in 2001 when the hardcover version of The Gourmet's Garden first came out. Our paperback version of 117 pages is printed on high quality slick stock for easy cleaning and is just as wonderful but easier to use as the hard cover edition. This book is included in our Gourmet Herb Garden Kit which includes The Gourmet's Herb Garden Cookbook and our Gourmet Herb Garden Six Pack. Purchase our Gourmet Herb Garden Six Pack Kit which includes The Gourmet's Garden and our Gourmet Herb Garden Six Pack and save!